There are four 20th Century memorial plaques. The one on the chancel wall is in memory of a victim of the Titanic disaster in 1912, Mr. R.C. Coleridge pictured left. He was instrumental in helping to form the 1st. Hunts (Hartford) Scout Group in 1908. Mr Coleridge had apparently booked on the 'New York' sailing from Southampton, but was offered a place on the Titanic sailing from Liverpool because there was a strike. There are of course, War memorials to parishioners who died in the two great wars of this century (See appendix 4). The other chancel window was restored in memory of Leonard & Phyllis Everett in 1983. Some of the memorials are mentioned in the text as they form part of the fixtures or fittings. There is a small pottery group of Christ showing a bird to some children commemorating H. Pardoe, who died in 1976. The churchyard was extended northwards in 1906 for reasons that are described in this cutting from the Hunts County News and this now includes an area for the interment of ashes. The 1951 Act of Parliament saw the discontinuance of new burials. The last recorded burial in a family grave was in 1978, according to the Record of Burials. The first 'Interment of Ashes' was in 1966. The churchyard is now in the care of Huntingdon Town Council. The map on the previous page, in conjunction with appendix 6, gives details of some of the inscriptions. The area enclosed by the dotted line on the north side of the church will be the site of our new extension. 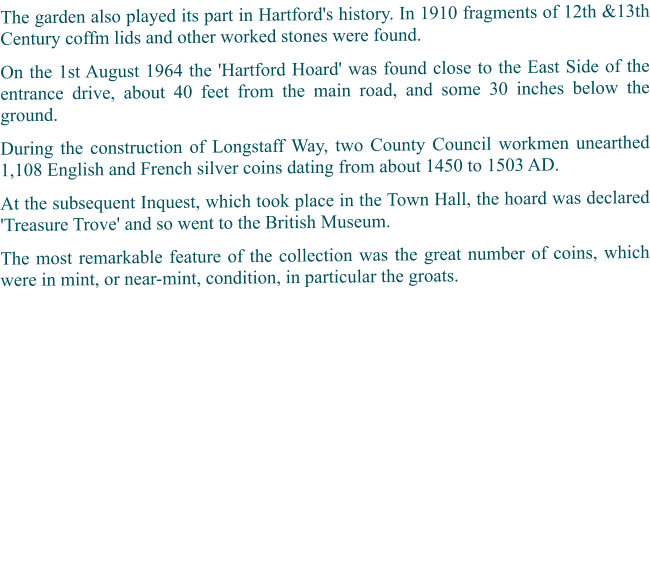 The earliest settlement in this part of the Ouse was Hartford. The village is older than Huntingdon or Godmanchester. Traces of Stone, Iron and Bronze Age settlements have been found. Names of these early villages are un-known, but the Saxons called it Hereforde, meaning 'army ford'. Introduction The Parish Church of All Saints' Hartford was originally built in 1180 on the site of a Roman watch tower in a picturesque setting on the banks of the River Ouse. The walls are of pebble and stone rubble with stone dressings and tiled roofs. Much rebuilding has been done especially in 1861 and 1895. Christian worship in the village can be traced back even earlier to 1086 when the Domesday Book records a simple wooden church, which was probably situated in the old vicarage garden. A further extension was completed in 2003 to add reception and heating facilities to the church. The Architecture Most of the architectural descriptions in this booklet are based on those found in the Royal Commission of Historical Monuments, An Inventory of the Historical Monuments of Huntingdonshire. See appendix 1 for a glossary of some of the architectural items. Edward the Confessor had held it and its value had depreciated considerably since his time £24 before 1066, £15 in 1086. The manor was assessed at 15 hides and there were then a priest, two churches, two mills, and a considerable quantity of woodland. At the time of the Domesday Survey, Hartford included King's Ripton, which accounts for the return of the two churches and mills. The parish also included The Royal Forest of Sapley, which has now completely disappeared. In the 17th Century, Hartford Manor lands were split up and sold to various people. Sir Henry Williams, alias Cromwell, had been granted the lands when the Priory, which had owned them for four centuries, was dissolved. Sir Henry's children sold them to Robert Taylor, and it was on his death that the Manor lands were divided in 1608. The new farms thus formed would have new houses for owners and workers. These would most likely be built in the village, but further away from the river. HISTORY Introduction The Parish Church of All Saints' Hartford was originally built in 1180 on the site of a Roman watch tower in a picturesque setting on the banks of the River Ouse. The walls are of pebble and stone rubble with stone dressings and tiled roofs. Much rebuilding has been done especially in 1861 and 1895. Christian worship in the village can be traced back even earlier to 1086 when the Domesday Book records a simple wooden church, which was probably situated in the old vicarage garden. A further extension was completed in 2003 to add reception and heating facilities to the church… Please access the desktop site for further information.